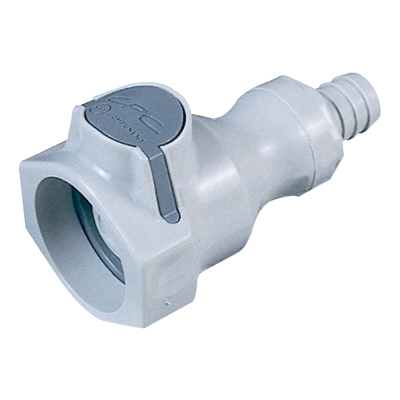 3/8" Hose Barb UDC PP Valved Coupling Body & Silicone O-ring - 1.73"H X 3.06"L | U.S. Plastic Corp. 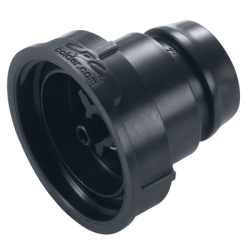 The patented 3/8" flow Universal Dispensing Coupler (UDC) provides a universal connection to a 38mm threaded or snap-in fitment neck. Make instant connections to bulk packaging systems including bag-in-box (BIB), flexible and rigid packaging styles. 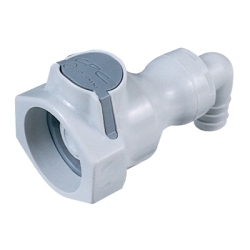 Automatic flush face valves minimize costly or dangerous spillage. An ergonomic design and a large, shrouded thumb latch pad produce a coupling that is easy to grip and simple to operate. The Main body component and valves are polypropylene. The body springs are 316 stainless steel and the cap springs are 302 stainless steel. 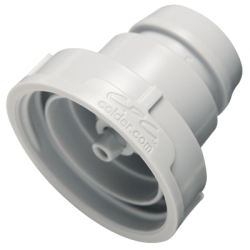 UDC caps are acetal or polypropylene. O-rings are available in EPDM, silicone, and Buna-N. Color is light gray with a dark grey thumb latch. 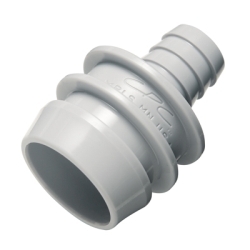 Closure sizes is a SP-400 thread/38 mm. All UDC series products are listed under NSF/ANSI standard 169.